So....here's the deal. I've been a Paper Pumpkin Subscriber from the beginning. 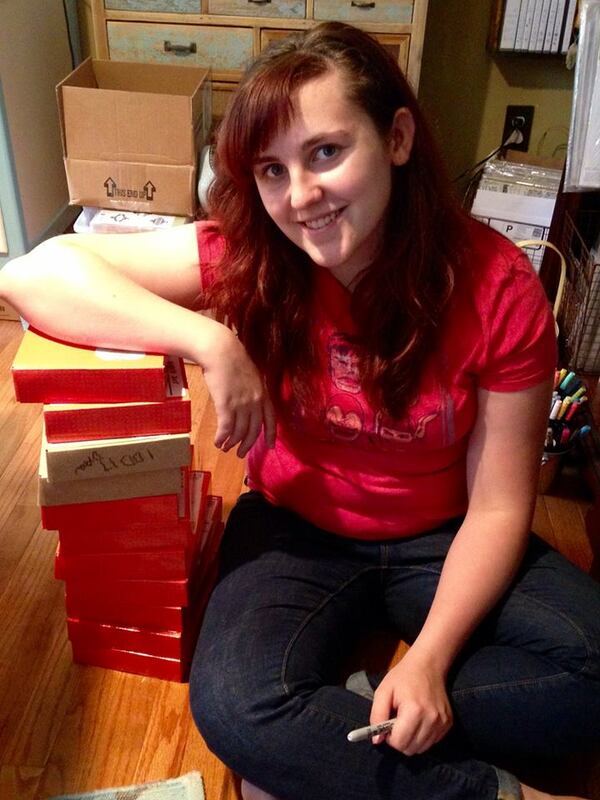 That's 2 1/2 years of those awesome cute orange boxes of crafty fun showing up in my mailbox - Each. Month. all those kits, doubles of some of them, and I've completed the sum total of 3 of them. That's a whopping 10% of those monthly kits. Yeah, I'm a real fireball when it comes to sitting down and whipping those bad boys up. A virtual creative whirlwind! LOL! At any rate, last month my daughter was able to join me at Convention, where she promptly fell in LOVE with Paper Pumpkin. And of course, when you see something through the eyes of your child, it takes on a whole new meaning. Her excitement has translated into my excitement and we've been crafting up a storm together since we've been back. Since we've been making such super cute things with these kits, I figured the least I could do was share the projects with you. After all, you *might* just have some of the same Paper Pumpkin kits laying around your craft room needing a little creative love. Hmmm??? These adorable pinwheels are from June 2014 and I honestly don't know why I didn't assemble them sooner. 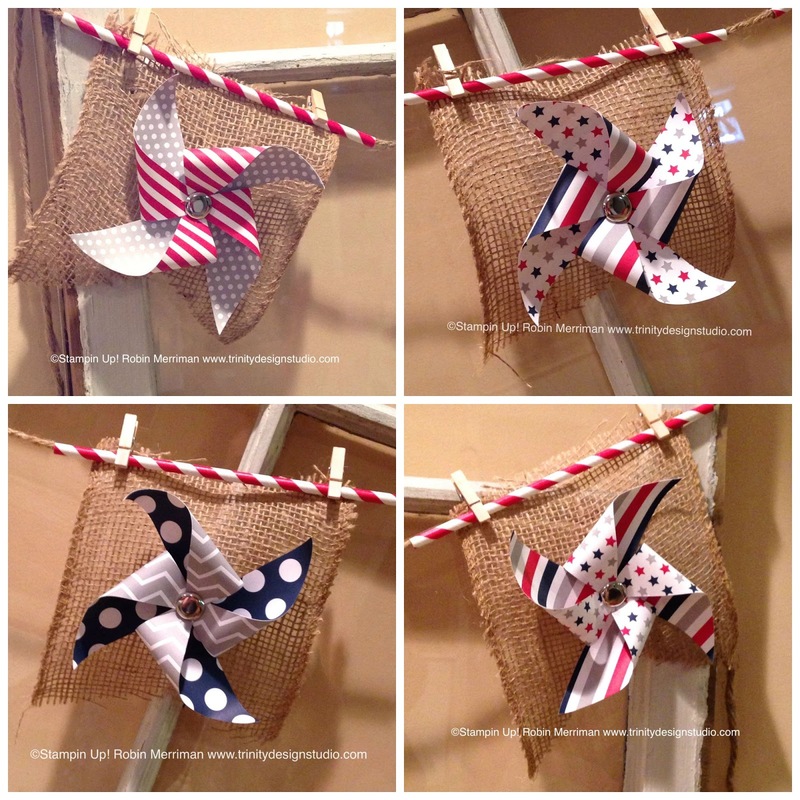 They are SUPER easy and quick and really, don't pinwheels just make you smile? The first project I did was this centerpiece. I made 5 of the pinwheels and used my Paper Piercer to punch a hole near the top of the paper straw. I pushed the large brad holding the pinwheel together through the hole in the straw and held it all together that way. No adhesive needed! 5 of them fit neatly into this water goblet and I used the King Leo peppermints as filler to hold them in place. One of the included banner pieces was clipped to the rim of the glass rim with a mini clothespin. Next, I turned my attention to a grapevine wreath that was hanging on my classroom wall. It used to have pieces of Regal Rose grosgrain ribbon tied in with the Real Red and Very Vanilla for a Valentine's Day motif. I simply removed those pieces and attached 3 of the Night of Navy polka-dot pinwheel pieces to the empty spots using some more mini-clothespins. Last, but not least - and this is my favorite project - I made a new banner for my antique window that hangs in my classroom. The burlap banner pieces are cut from a 10 yard roll that I purchased at Walmart. The pinwheels are simply attached to the burlap with the brad that holds them together. No adhesive! I used the paper straws that came in the Paper Pumpkin kit as a 'cover' for the thick twine I used to string the banner. They were perfect for some additional color but also worked great to clip the banner pieces to hang them! There are a ton of really cute projects that were made with the pieces of this kit - you can find a lot of them on Pinterest. I chose to keep the pinwheels as they were intended, but I just used them in a few different ways. Pinwheels are nostalgic and remind me of a simpler time and since they make me smile, I decided to not mess with a good thing! I hope you enjoyed these projects and hey, did you know that if you are a NEW Subscriber to Paper Pumpkin through September 10th - your first 2 months are 50% off?!? Yep, that's what I call a deal! Each kit includes pre-designed, assembly ready paper crafting projects along with a NEW, exclusive stamp set and inks, plus all the supplies you need to make the projects as shown. It couldn't be easier to make something super cute, super quick! I really encourage you to give it a try - and don't be like me! Open those kits and make the awesome projects inside! Invite your daughter or a friend to join you for a fun crafting night. Come to my monthly Paper Pumpkin Play Time and make your kits plus get lots of other creative ideas for using the supplies included! Click the 50% off ad above to visit the Paper Pumpkin website to sign up. Be sure to choose me as your Stampin' Up! demonstrator - Robin Merriman #112744! When I am notified that you've joined, you'll receive a special Thank You card in the mail from me, plus new inspiration each month on different, creative ways you can use your Paper Pumpkin kits! She chose 11 of my past kits to play with and she's having a blast! Emma's enjoying Paper Pumpkin - it's time you gave it a try too! You can choose a gift subscription too, it might be just the thing for the crafty teen in your life! Weekly Deals - Grab 'em While You Can!